ASP.NET MVC 6 Hosting - HostForLIFE.eu :: How to Call A C# Function With jQuery AJAX In ASP.NET MVC? jQuery AJAX method is a very powerful function for doing asynchronous operations from the Web pages. It helps to update parts of a Web page without reloading the whole page. This increases the Website's speed and reduces the load. It can be used with any Web technology like HTML, ASP.NET, ASP.NET MVC, PHP, Ruby or any other. With jQuery AJAX method, you can create high performance features in our Website. Let me show you how to use this method in ASP.NET MVC page. To understand the working of jQuery AJAX, I will create a login feature in ASP.NET MVC page. The page will have 2 input controls to enter the username and the password. There will also be a button to submit the two values for checking from the database. When the username and password are correct, the secured information of the user is shown, else the “wrong username and password” is shown. The main attraction here is that I will use jQuery AJAX method to check the username and the password. There will be no page reloading during checking. To start learning jQuery AJAX method, I would suggest you check – jQuery AJAX. Also, look for the syntax and the key-value pairs that can be passed to this method. 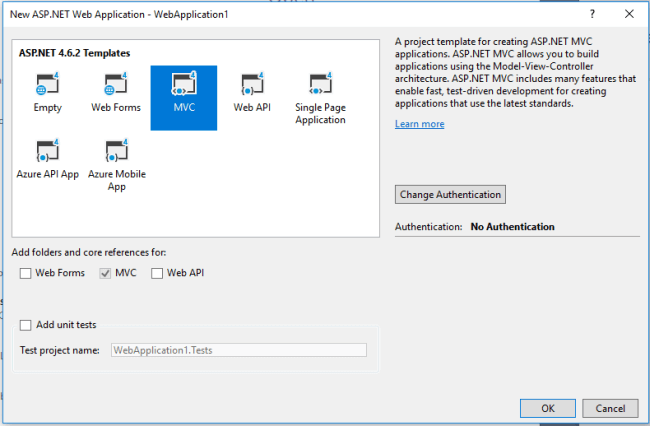 Start with creating a “Controller” in your ASP.NET MVC Application. Now, add a C# function “GetSecuredData” into the controller. The C# function given above will be called by jQuery AJAX method. As you can see, this function has 2 parameters, “username” and “password”. In these 2 parameters, it receives the username and the password values. It then checks them and shows the secured information, if they are the correct ones. You can also change the code given above to include the database operation, where the username and the password are checked against the ones stored in the database. Now, create a view for the Controller. This view will contain the two input controls for the username and password. There will be a button, which when clicked will call jQuery AJAX function. The button click event will call jQuery AJAX event. We pass the “controller name/function name” to the URL field. The jQuery AJAX event will call the C# function which gets the username and password values in its parameters. Finally in the success function we will show the returned value from the C# function. ASP.NET MVC 6 Hosting - HostForLIFE.eu :: How To Open PDF File In New Tab In MVC Using C# ? In this post, we will learn about how to open PDF or other files in a new tab using C#. For this example, first we need to return a file from MVC Controller then open the file in a new tab from view. For this, I will set return type "FileResult" from MVC controller and return "File" with a byte Array of the file and its content type. Let's start coding. 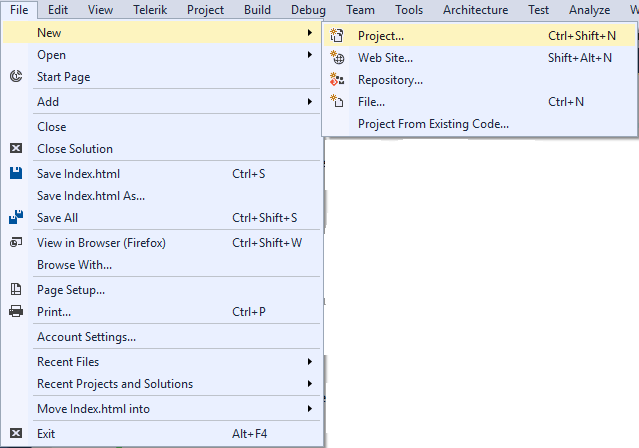 First, create a new project of MVC from File -> New -> Project. 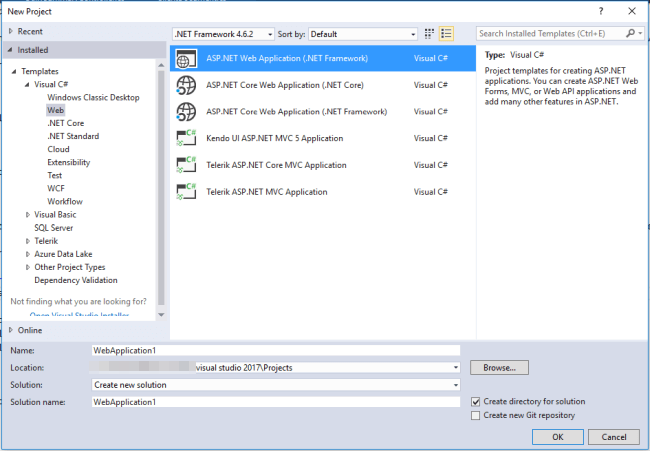 Select ASP.NET Web Application (.Net Framework) for creating an MVC application and set Name and Location of Project. After setting the name and location of the project, open another dialog. From this dialog select MVC project and click OK.
After creating a project create one controller method inside the home controller and name that "GetReport". and write the below code in this method. Above method returns FileBytes, and Content type is "application/pdf". Create one function for an open PDF file in a new tab. The above function will open a new tab in the browser and call controller GetReport() method and this method returns file ,and browser is displayed in an opened tab. In this article, I will be explaining 3 different ways to handle exceptions and display a friendly error page to the end user. Friendly Error Pages are the pages that you design to show the end user when any kind of not handled exception happens in your application and your expected result is not achieved. So, instead of presenting your end user with technical information regarding the exception, you show him a friend page. Also, presenting your end user with technical information is not a security best practice. So, let's see the three ways. It is a filter that is called every time an exception occurs in the applied methods. Why would I use a custom exception filter? Because with a custom exception filter, you can handle in a generic way every kind of exception thrown by your actions and/or controllers. You may use custom exception filters to log your exceptions. Create a new class named CustomExceptionFilter. What this custom exception does is to redirect to your About action in your Home Controller. Do not forget to set the ExceptionHandled equal to true; otherwise it will not take effect. Apply your custom exception filter to your controller/action. You can see that the exception filter is applied only to your Index Action so if you access your Contact action, you will be able to see the non-handled exception page. Why would I handle an exception by web.config configuration? It is easy to configure and useful when you do not need to log or work on the exception. Include this in your web.config inside the system.web tag. Observation - Like the custom exception filter, you may choose if you want to handle the exceptions at the Controller or Action level. Also, here, the handled exception is applied only to your Index action, you may see the non-handled error in the Contact View. It is to override the global exception handler of the application. Why would I handle an exception by global.asax Application_error? You do not need to set the places that you would like to handle the errors like before where you had to set the actions and controllers to be handled. Here, every exception will hit and be handled. Like the custom exception handlers, it is very important to ClearError() in the Server. What is done here is the redirection of non-handled exceptions to the About action in the Home Controller. Congratulation, you just learned three good ways of handling exceptions in your application and presenting friendly error pages to your end users. Now let’s begin with implementation. For this, you need to install log4net from NuGet Package Manager to your ASP.NET MVC project as per the below screen. Now open web.config and enter the following details. Add a class Log.cs in the Utilities folder. Now, in the constructor of this class, instantiate logs for monitoring and debugger loggers. Here, you need to create Debug(), Error(), Info(), Warn(), Fatal() methods which will call respective methods from Log4 net. Now, you need to call the logger class that logs directly into your action method. In this article, we will learn how to list all users with Associated Roles in ASP.NET MVC 5 using Identity. ASP.NET MVC 5 does not come with an inbuilt feature to list users with associated roles by default. 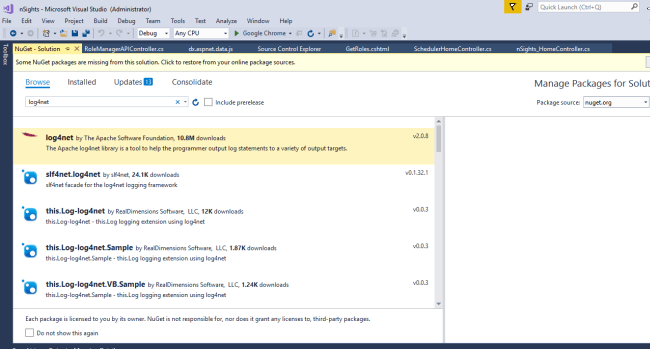 However ASP.NET MVC have inbuilt UserManager, SignManager and RoleManager to assist this. We need this feature in each of our applications as users are to be maintained along with their associated roles. We can apply a number of ideas to do this. In this article, we will learn a very simple way to list users with their associated RoleName as in the figure below. Add a new method called UsersWithRoles inside ManageUsersController and add the following codes. Note - context.Users represents the table AspNetUsers which has navigation property roles which represent the AspNetUserInRoles table. Now, let’s add a View of UsersWithRoles method of ManageUsersController. Now, the above method and View will return the users to their roles. In this project, the description is about the steps to create treeview structure of File and SubFile using AngularJS in MVC and This procedure can be implemented in case of Modules and related pages under each module in ERP type of project. So, here I show you a project which you can implement in a real-time scenario for better understanding of how many pages there are under respective Modules and the relation between Module and its corresponding pages.